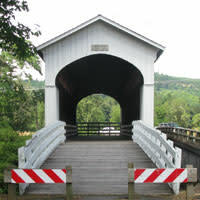 The six covered bridges of the Cottage Grove area bring visitors from all over the United States. 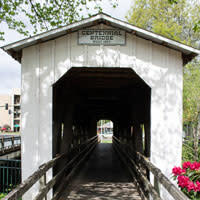 It is why this city is known as The Covered Bridge Capitol of the West. Each bridge has unique design elements so you will want to set aside some time to look at those details at each bridge. Located at the corner of Main St. and River Rd. 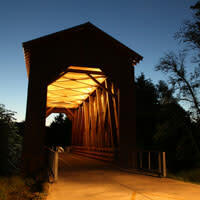 in downtown Cottage Grove, this pedestrian bridge was built in 1987 from old timbers from two demolished covered bridges - the Brumbaugh and Meadows Bridges. (1) Centennial Bridge: From I-5 Exit 174, head west toward downtown, go over bridge and continue on Highway 99, turn right onto Main St. Bridge is 6 blocks ahead on the right. Located a .5 mile upstream from Centennial Bridge, it was built for foot and bicycle traffic and was mostly used by children crossing the Coast Fork to get to school. This is the fourth bridge built on this site and earlier versions could swing side to side. (2) Swinging Bridge: Heading west, turn left onto River Rd. Bridge is .5 mile ahead on the left. This bridge is the only remaining covered railroad bridge west of the Mississippi River. It was built in 1925 by lumberman J.E. Chambers to cross the Coast Fork of the Willamette. In 2011, the bridge was restored to its original state and can be crossed on foot or by bicycle. It is listed on the National Register of Historic Places. (3) Chambers Bridge: Continue south on River Rd. Bridge is .3 ahead on left. 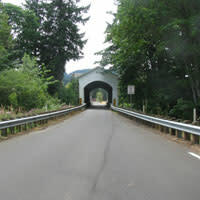 The Mosby Creek Bridge on Layng Rd. 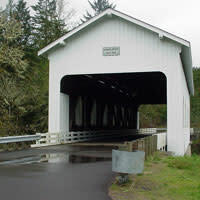 just SE of Cottage Grove is Lane County&apos;s oldest covered bridge and the only bridge in the area with through traffic. Built in 1920 and restored in 1990,it is named for pioneer David Mosby. (4) Mosby Creek Bridge: Proceed south on River Rd. to Highway 99, turn left and go all the way to Main St. Turn right and continue 3.25 miles. Bridge is on the left at Layng Rd. This 60-foot bridge, built in 1930 and restored in 1996, is located on Garoutte Rd. You will find it 1.25 miles SE of Mosby Creek Bridge on Mosby Creek Rd. The deep water below the bridge is considered one of the best swimming holes in the county. (5) Stewart Bridge: Continue east on Mosby Creek Rd. Bridge is 1.25 miles ahead on the left at Garoutte Rd. Located on the south side of Dorena Lake on Shoreview Dr., Dorena Bridge was built in 1949 to connect Government Rd. and Row River Rd. It was restored in 1996. Drive through the bridge to parking lot for great views of the river. (6) Dorena Bridge: Follow Garoutte Rd. 2.5 miles to Shoreview Dr., turn right and go 5.5 miles. Bridge is on the right near junction with Row River Rd. 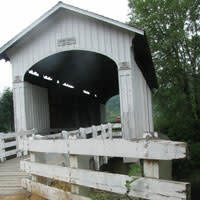 The Currin covered bridge was originally built in 1883. rebuilt in 1925 and restored in 1995. It is located on Layng Rd. spanning 60-feet across the Row River, and has been the site for numerous weddings and special events. (7) Currin Bridge: Turn left onto Row River Rd. and go 8.5 miles. Bridge is on the left at Layng Rd.